En mycket slitstark mollskinnsbyxa med smalare ben än Le Laboureurs mollskinnsbyxor. The original “Elephant Skin” fabric dates back to the Industrial Revolution in the late 19th century. Manual laborers such as welders, carpenters and mechanics favored the strong and durable, yet comfortable “Elephant Skin”. As back then, our “Elephant Skin” is made in Germany to the former standards and with the same formula, which has not changed over one century. Only by choosing the original German fabric we are able to use the basic ingredient for the most authentic traditional workwear series available. This way we can assure that our “Elephant Skin” garments are made for the strongest wear and will pass the hardest tests! The name “Elephant Skin” was chosen due to the fact, that although consisting of 100% organic cotton the fabric shows the same characteristics as real leather. Our finest Pike Brothers details characterize the 1958 Roamer Pant Elephant Skin Black: • 100% organic cotton, 529 grams per square meter • straight leg, regular fit with button fly • buttons and rivets in a zinc finish • heavy bar tacking on pockets, belt loops and seam ends • D-ring attached to the watch pocket for your pocket watch chain Attention! In order to get the most mileage out of your Pike Brothers Roamer Pant Elephant Skin we strongly advise to follow the washing instructions in the leaflet! For the detailed measurements please see our sizechart. Our “Elephant Skin” fabric is sanforized! Shrinkage: Due to the natural characteristics of organic cotton, the fabric will shrink when coming into contact with water, especially warm water. 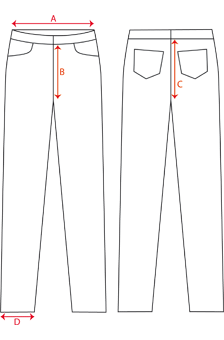 So when you are choosing your correct size, please note, that these pants can shrink up to 2-3 cm in length and about 1cm in the width!